Tomoko Nakanishi, right, was among a group of new University of Hawaii law school students who took the Law Students' Pledge yesterday at Hawaii State Supreme Court in Aliiolani Hale. The pledge was given by Hawaii Supreme Court Justice Steven Levinson. 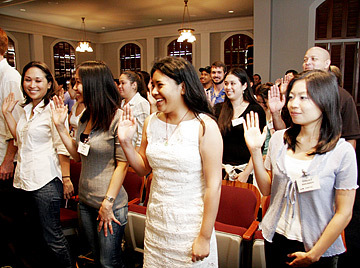 The oath was written by the late law school professor Chris Iijima and was a "first" in the country when it was initially administered several years ago. 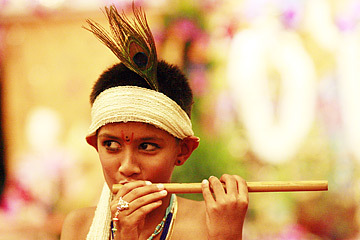 Neel Kotak, 9, got dressed up for a Krishna look-alike contest held last night at the International Society for Krishna Consciousness temple in Nuuanu. The contest was part of a birthday celebration for Krishna, who appeared for the first time in Vrindavan, India, approximately 5,000 years ago.